If you’re looking for a proven counter-cyclical oil play, look no further than Otto Energy (ASX:OEL). Earlier this year, with the price of oil at $100 a barrel, OEL sold its Galoc Oil Field in the Philippines for US$108MN, and returned AU$74MN (70%) back to shareholders as a thank you for their patience. Given the temporary down cycle in the price of oil, and OEL being cashed up compared to its peers, it has embarked on an acquisition hunt that has led it to the Gulf of Mexico. In a move that would have been almost impossible in a high oil price environment, OEL has managed to insert itself in prime Gulf of Mexico real estate – a region with yearly production in the hundreds of millions of barrels and significant existing infrastructure to tap into. OEL has just farmed into Bryon Energy’s multi-asset portfolio onshore Louisiana and offshore Gulf of Mexico. It’s fair to say OEL’s new partner knows this ground pretty well. At the same time, oil exploration is inherently risky, and there is no guarantee OEL and its new partner will successfully find oil on the upcoming drilling. Now that OEL is on board, drilling is marked for next quarter with OEL taking a significant stake in it – so it won’t be long until OEL shareholders get a result either way on this acquisition. OEL have been thinking long and hard about the next place the company wants to discover oil, and this project came out on top after an extensive review of over 600 projects across the globe. OEL has also had somewhat of an upper hand with a large cash pile. OEL’s share price is currently cash backed – OEL has $47M in cash, or the equivalent of 4 cents a share, meanwhile the actual share price is trading around 2.2 cents a share. 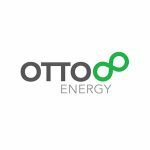 Otto Energy (ASX:OEL) is a countercyclical oil explorer with a proven track record of finding assets on the cheap and selling them for a profit. It’s most recent lucrative disposal was the Galoc Oil Field in the Philippines, sold to Nido Petroleum for US$108MN. The deal saw its shareholders rewarded with a AU$74MN pay out, at $0.064 per share. Being the proactive explorer we like to see here at The Next Oil Rush , OEL is back in the thick of things with yet another acquisition – this time in the Gulf of Mexico. Not to put its oil all in one barrel, OEL still has a stake in high prospective assets in Tanzania and Alaska, taking its intercontinental exploration portfolio to three. Plans are in place for OEL to be drilling in Gulf of Mexico, Tanzania and Alaska – all in 2016, all funded. Low oil prices tend to mean tighter profit margins for oil producers, but also, cheaper acreage if you happen to be on the lookout for strategic assets that can be rapidly proven up. The Gulf of Mexico is a prolific oil region and the Joint Venture that OEL has joined is wasting no time and as we have indicated, already has plans to drill as a priority in early 2016. OEL has proven before that it has what it takes to navigate the oil landscape without losing its shirt. Despite seeing its recent offshore well the ‘Hawkeye-1’, fall short of commercial expectations, OEL managed to recoup a healthy US$24MN from BHP Billiton, and is now cashed up and ready to make an impact with ongoing exploration. Having said that, oil exploration is still a risky business, and OEL is still a junior player. It’s always good to do your own research, and also seek professional advice when considering a stock like OEL for your portfolio. The team at OEL has a sharp eye for strong assets which present near term opportunities, and OEL currently has a supreme exploration arsenal that will hopefully deliver a big oil find. Exploring in three oil exploration hot spots, OEL plans to get its drill bit in the ground on all three of its assets next year. 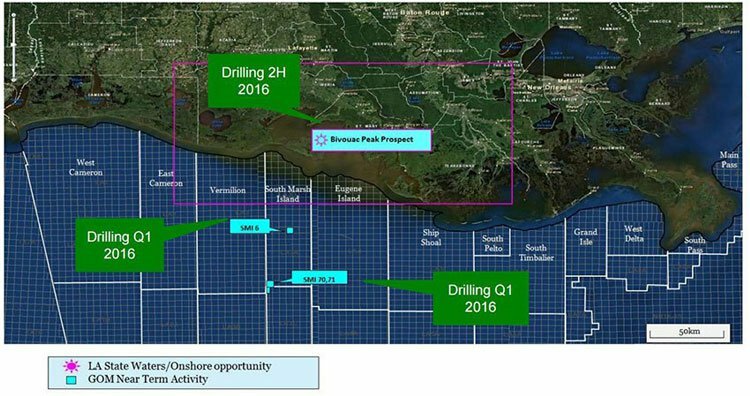 The first to look out for is the Louisiana/Gulf of Mexico project where three wells have been pencilled in for Q1 2016. Let’s take a look at what kind of potential OEL is working with in the deep south of the US. The Louisiana/Gulf of Mexico asset presents a low cost but high chance of success oil play for OEL. This is the kind of asset OEL is now focusing on amidst an oil price downturn that has seen prices fall below $35 per barrel. If this asset works now, imagine when the price of oil rebounds? OEL has farmed-in to the region through Byron Energy , an existing operator that has built up a strong portfolio of assets in the shallow waters of the Gulf of Mexico and onshore Louisiana. Bigger drill targets sit up-dip from known production, in the same highly productive reservoirs. You can see all three of the leases below, with Bivouac Peak prospect onshore, and SMI-6 and SMI70,71 sitting in shallow water. OEL has an option to claim a stake at Bivouac in the 2 nd half of 2016. But before that, OEL will jointly explore the South Marsh Island SMI-6 and South Marsh Island SMI-70/71 licenses by paying up to $14MN in gross well costs, in exchange for a 50% working interest across all three licenses – both will be drilled next quarter. Lying in a water depth of 65 feet, the SMI-6 lease has had a total production of 18 MMbbl and 36 Bcf of gas. Drilling is planned for Q1 2016 – that’s next quarter, with OEL participating in order to earn a 50% participating interest (equal to a 40.625% revenue interest) in the block. The success case outcome will see OEL book reserves throughout 2016, with planned production development by way of low-cost tie in to existing infrastructure planned to be complete mid-2017. With existing production all around, and infrastructure nearby to tie into, it may not be long until this asset is in production. Once the SMI-6 well is complete, OEL will turn its attention to SMI-70-71 to the south, for which it has the option to earn a 50% participating interest through the drilling of one well. 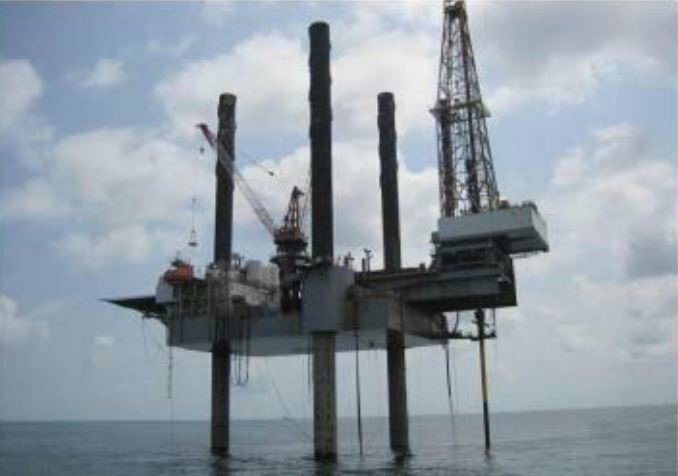 SMI-70 sits in a depth of 131 feet and combined production from the blocks totals 5.9mmbo and 16Bcf of gas. 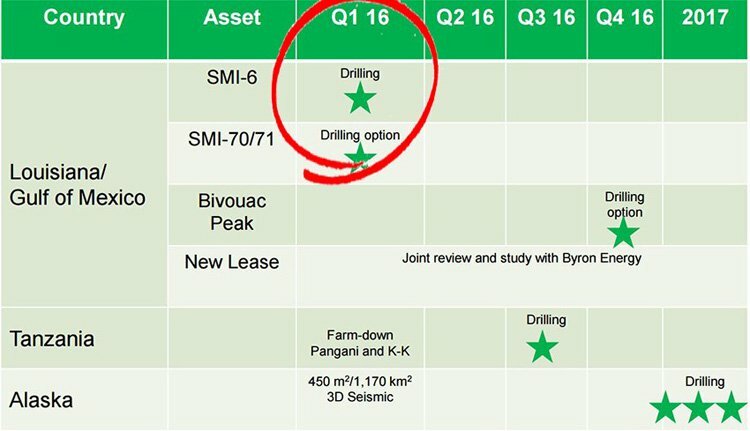 Like SMI-6, drilling is expected to begin in Q1-2016. The Gulf of Mexico is traditionally a very sought after region for oil companies – its doubtful OEL would have been able to bag this farm-in deal if oil prices were higher than they are today. This acquisition represents a countercyclical play with a view of seeing the value of this asset recover alongside the oil price. If this eventually materialises, OEL will be in a perfect position to offload its 50% stake or alternatively, commit further funding to exploration and actually prove up a resource that can be extracted and sold. Knowing OEL, it will probably look to put more smiles on the faces of shareholders considering the length of time it would take to progress the resource and drill a production well. Byron Energy has already pumped in excess of US$20MN into the three assets and conducted high end RTM processing on the available seismic, to help improve the imaging around the salt domes and better target updip volumes – and this work to date was one of the attractions for OEL coming on board. So far, Byron has collectively drilled over 140 wells in the Gulf of Mexico with a success rate above 80%. As you can see OEL has setup a progressive farm-in deal where it has the option to pull out of further spend after each well is drilled. This gives both control and prevents excessive expenditure in case of a failed result. ... but importantly, didn’t break the bank with excessive spend. If you’re going to swing for the fences, don’t waste all your energy on one swing. For an oil explorer, OEL’s approach is conservative, whereby each and every asset it’s exploring has failsafe measures to protect its cash balance and bottom line. From its SMI-6 license, OEL is looking at a total prospective resource of 3,600 million barrels, with proved reserves at 567 million barrels. 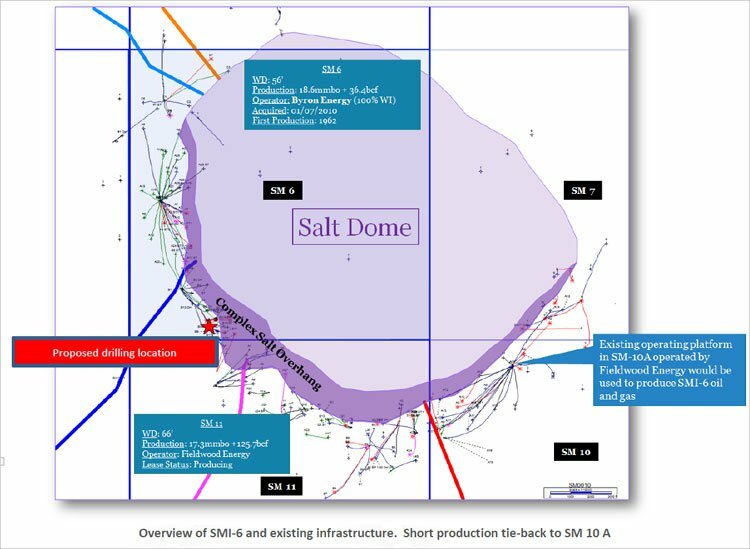 SMI-70/71 adds a further 2,300 million barrels of prospective resources, with 249 million sitting in the proved reserves category. OEL are not going after small resources here, and success on the series of upcoming drilling events could materially change the company – for the better. At the same time, the drilling may not prove successful – there are no guarantees here, and OEL is a speculative stock. OEL’s first well as part of its farm-in with Byron Energy will be drilled to a depth of 3000m. The site is located in 20m of shallow water only – which is another plus towards keeping costs down both in exploration, and if it the asset can move into production. By drilling the first well next quarter, OEL will earn the right to obtain a greater share of equity in other parts of Byron’s asset – namely the Bivouac Peak Leases. OEL’s timeframe is 12-18 months for the next drills, spending around $4-5MN to achieve an initial production rate of approximately 1400 barrels of oil per day (bopd). OEL’s strategy is geared towards progressing assets as quickly and efficiently as possible in order to generate a sale or raise the value of the asset for potential production. When it comes to oil and gas regions that are currently in the limelight, Alaska could just be the frontrunner. Alaska contains some of the largest conventional oil fields in North America, producing over 17 billion barrels of oil and 13 trillion cubic feet of natural gas in its history. The US Geological Society estimates the Alaskan North Slope to hold 40 billion barrels of oil with several huge resources already found. The region is seeing incredibly strong exploration interest, partly on the back of government funding and tax breaks to explore previously untouched ground with giant multi-hundred million barrel prospects. And now with oil and gas prices weakening, several oilers have jumped at the chance to explore Alaska, for a significant oil reserve. In order to make its move into the frozen steppes of Alaska, OEL snapped up Borealis Petroleum Ltd for $1.2MN in August 2015. The acquisition set the stage for OEL to earn an interest in a substantial acreage position courtesy of non-binding, staggered capital injections that give OEL the freedom to pull out, but also, the opportunity to buy in more. OEL paid US$7MN to Great Bear Petroleum in exchange for an 8% and 10.8% working interest in two areas of the Alaskan North Slope in October as a sign that this region deserves more attention, rather than less. OEL will spend US$6MN to drill up to three new wells. In addition, OEL has an option to acquire an 8% interest in a further 22,804 acres which includes the recently drilled Alkaid-1 exploration well (shown above). 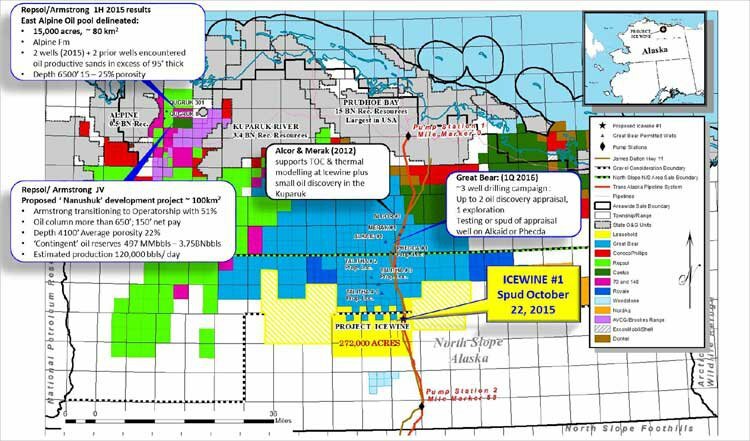 In recent weeks, another junior explorer – 88 Energy (ASX:88E) discovered oil shows at its Icewine-1 well in Alaska. Regular readers of the Next Oil Rush should be familiar with 88E and its Alaskan exploration – our most recent article contains all the latest info on its progress: 88E Doubles Leverage to Potential Mammoth Oil Find . 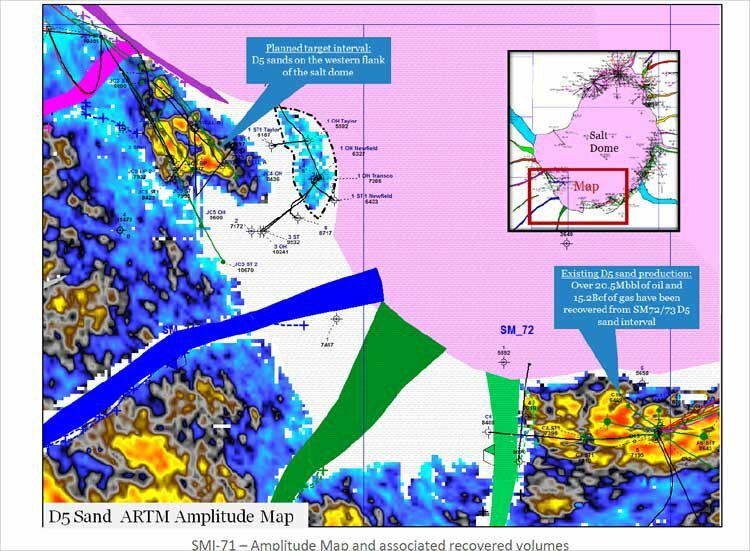 If we take a look at the map below, you’ll see 88E’s plot, highlighted in yellow, being within a proverbial stone’s throw from OEL and Great Bear’s ground in blue. 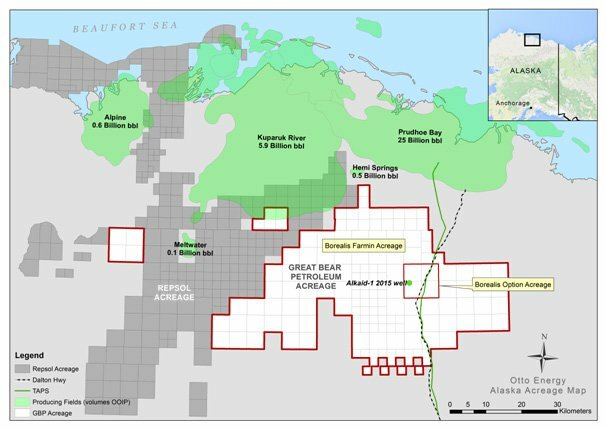 Great Bear’s vast acreage on the North Slope – 558,195 net acres, is immediately south of the massive 25 billion barrel Prudhoe Bay field and adjacent to the 5.9 billion barrel Kuparuk field. ...it all adds up to meaning that Great Bear’s acreage is highly prospective so even a 10% stake could reap significant upside for OEL. The key aspect for OEL is that Great Bear has already committed over US$150MN to acquire 2300 sq. km of 3D seismic data which means that once all that seismic data has been interpreted and understood, drilling can commence. Currently, OEL and Bear plan to conduct a further 1170 sq. km. of new 3D seismic surveys, with OEL fully carried by Great Bear. Last but not least, OEL completes its asset portfolio with a 50% working interest in a low cost onshore play in Tanzania. 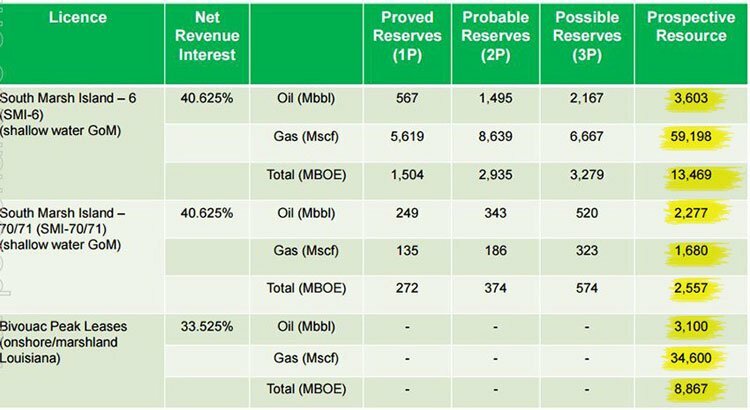 OEL’s Kito Prospect has a net prospective resource of 19 MMbbls (low estimate), 60 MMbbls (best estimate) or 170 MMbbls (high estimate) with stock-tank oil initially in place (STOIIP) of 192 MMbbls (low), 596 (best) and 1,602 (high). 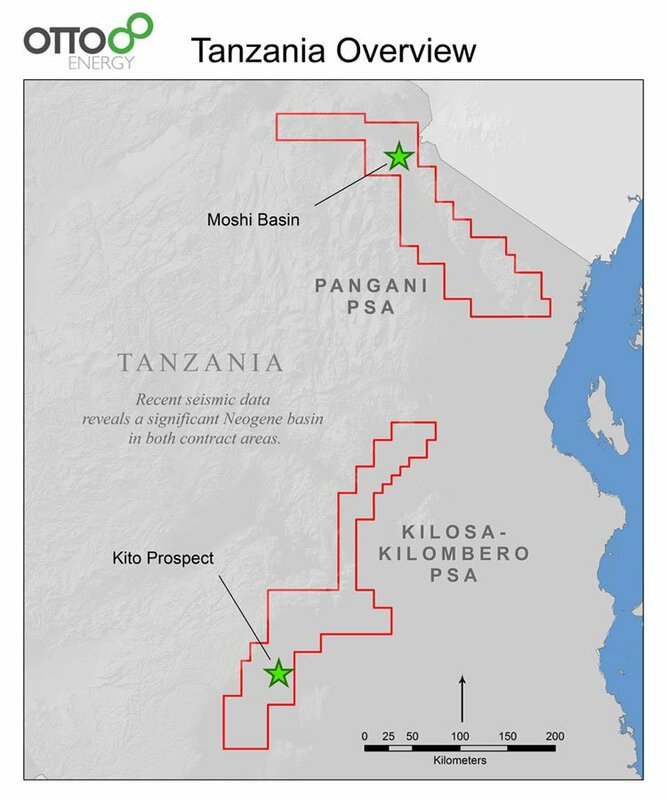 OEL is due to commit around $10MN towards drilling of its majority owned Kito project in Tanzania – sharing the development workload with Swala Tanzania and Tata Petrodyne (TPL), a subsidiary of US$110BN-capped Tata Group. We have followed Swala Energy extensively previously , and covered off on the ramifications of a discovery on the ground it shares with OEL. Quite simply, this is large resource, play opening potential territory, and follows on from Africa Oil (TSX:AOI)’s giant discoveries over the past few years. As any oil explorer or investor knows, when the drill bit hits the ground, it’s an opportunity to prove up something substantial (and therefore raise valuation) or hit nothing (with valuation understandably falling). OEL is now in a position to share its drilling costs while having significant exposure to whatever is found. Sharing is caring at the end of the day and OEL has used sound rationale in today’s depressed oil market environment to position itself for a good strike and higher value. As you can see, the Gulf of Mexico asset is taking priority with drilling scheduled for next month . Oil exploration is all about risk vs reward. If you want the spoils all for yourself, you will have to pay for it by going it alone and doing all the heavy lifting. OEL is taking a different, more conservative path. In the current market environment, even the larger mature producers are keen to partner and form joint-ventures and farm-ins in order to reduce the impact of any dusters and also because project economics become increasingly difficult with oil prices below $40 per barrel. By strategically farming in to all of its assets, OEL ensures it’s lean enough to weather the current commodities downturn, while the at the same time maintain exposure to large multi-million barrel prospects that could lift its $26M market cap significantly. After all, a little bit of something is better than all of nothing.